Monolithos squats upon Santorini’s backside. Volcanic black sand with a background of industry: the island’s power plant, low buildings, chimneys, a storm water outflow, and beyond, the airport. 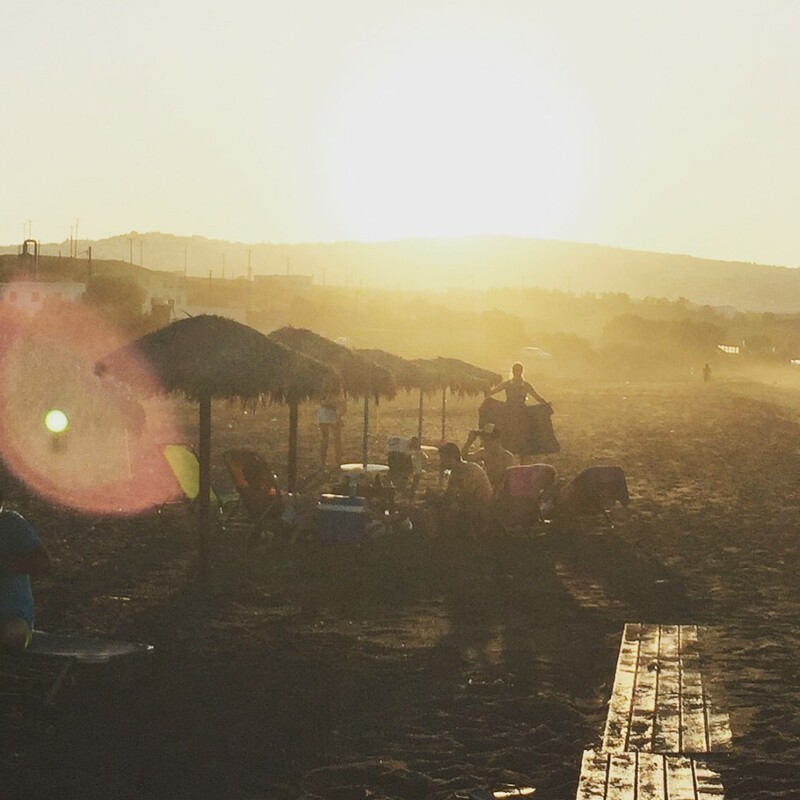 It’s probably Santorini’s least glamorous beach, or nearly. It’s described as “family-friendly”. That’s a worry. For my family, though, it’s ideal. 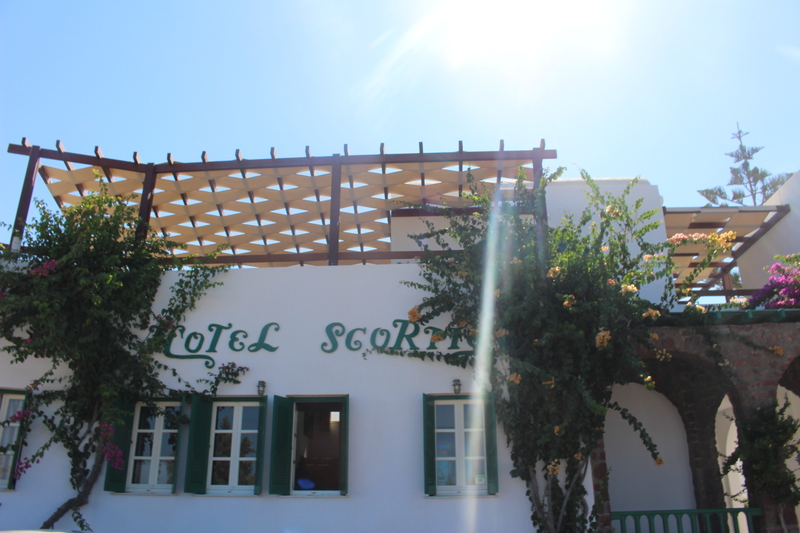 We’re staying at Scorpios Beach Hotel, a tidy and welcoming cluster of apartments facing the beach. Next door a greyish chimney flanks a low, flat structure – a heritage-protected, if not heritage-maintained, site. Built in the nineteenth century, it was the island’s first tomato processing plant. Santorini’s tomataki, the local cherry tomato, is a celebrated delicacy. Tomato farms were a key component of the island’s early farming trade, industry that has been substantially subsumed by the appetites of tourism. Renting accommodation pays easier returns than scratching the dry dirt. Viticulture remains, perhaps through an assimilation with tourism. New tourist-facing wineries strut everywhere along the island’s pretty vantage points. This Santorini is a changed place to the island I visited in the early 1990s. Then, arriving at the end of May, as the summer season was waking, touts greeted the tourists at the port with the usual offers of transport and rooms in the houses of brothers and cousins. Now, the tourists – plane after plane on cheap flights from Rome, Athens, Brussels, Dusseldorf – seek out locals to hire quad bikes, mopeds, cave-house rooms clinging to cliffs. Daytrippers file off cruise ships in a stream of shiny coaches to tick off the island’s must-dos. A convoy of massive buses rumbles past on a winding little road. We stop counting them at 17. 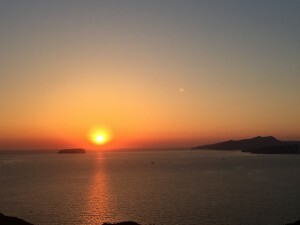 I’ve brought my family to this island partly to watch the sun setting over the caldera from the town of Oia (just like all these other good travellers); the spectacle is rightly celebrated. However, sightseeing traffic already crowding Oia by mid-morning is changing these plans, and quickly. I’m having a Sartre moment. Hell is other people. Oia is barely recognizable – manic with money and those who want to spend it. Was it like this 20-odd years ago? “That’s why I never visit the same place twice,” says Kostas, an affable bloke who runs Beach Sports Arena opposite Scorpios in Monolithos. He’s right, of course. You shouldn’t go back and expect any destination to stand still in your absence. Especially a desirable one. 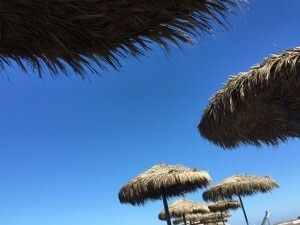 Kostas has created pre-teen funtown here, installing the requisite umbrellas and deck chairs, basketball courts, casuarina-shaded ping-pong tables, and a beach soccer field. He is my sons’ hero and saviour. 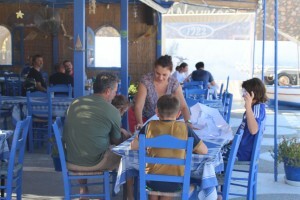 These simple facilities will ensure that Santorini is a highlight of our extended holiday. The arse end of Santorini, at that. In fact, we arrived at the beach at a serendipitous moment – after weeks of travelling with the crowds of a European summer, a 3am start to catch a flight here from Rome, and a morning spent driving alongside improbably double-decker tourist buses on streets built when donkeys were Santorini’s primary means of transport, to simply stop and chill is essential for familial sanity. It’s not the prettiest of beaches. (None here really are; it’s not that kind of island, although some are rather handsome.) But right now, it’s our favourite. Over the afternoon, the atmosphere becomes jovial, and local families join the Italian, English, French, and us. Kosta’s nephew is celebrating a birthday, and our toddler is invited. The big boys – both football mad – find plenty of company for a game. Speakers fire up, music flows through the afternoon’s salty haze, and Kosta wanders around offering beer. In Santorini, this is dubious truth. The late afternoon turns the sea haze golden, and my partner chats to a woman next to us who looks like a 21st century Sophia Loren. Right now, not even the perfect backpacker’s bucket-list sunset could make me face the crowds of Oia. We leave the sun to set behind us, facing east on the arse end of the island, next to the power plant, and my family are relaxed and content. This end of Monolithos is separated from the main beach by a rock groin. Impromptu beach party atmosphere adds to the feeling that it’s just that little bit cooler than the main beach. 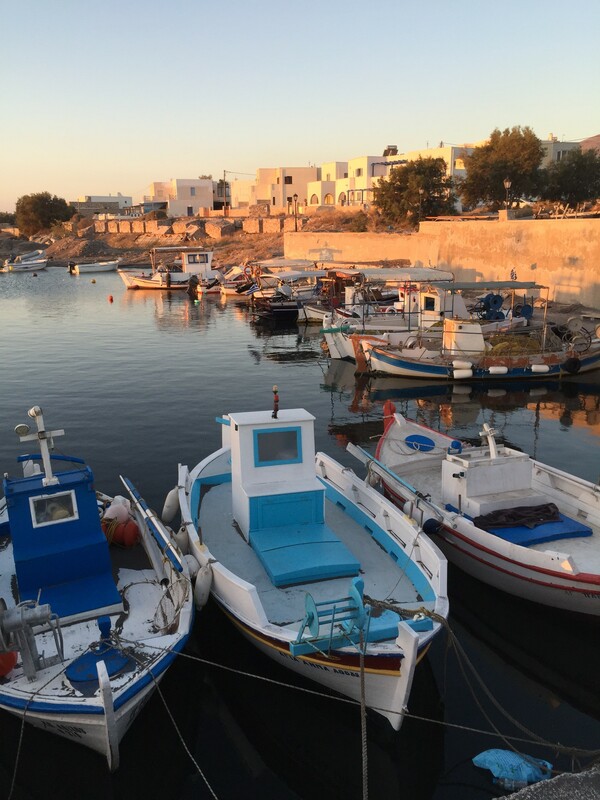 When the necessity of feeding a toddler nudges us away, we stroll a couple of minutes south, and hit Captain Loizos’s Taverna. It’s an extraordinarily good meal. We eat lamb baked with lemon, pork souvlaki, the best Greek salad we’ve experienced so far, a serve of house-made sausages that take three of us to help finish. The lamb and pork here are sourced from Naxos nearby. The tomatoes, of course, are local. Our host presents my partner and I with a potent home-brew spirit in a little bottle to complete the meal (the kids get watermelon). It puts a stumble in our steps home. Not much has changed in Monolithos in 20 years, the owner of Scorpios, Sousanna Vazeou, tells me. 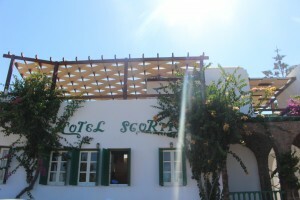 Sousanna’s father Spiros built the resort in 1998. (It’s a self-rated four-star hotel, although one of those stars looks a bit wobbly.) 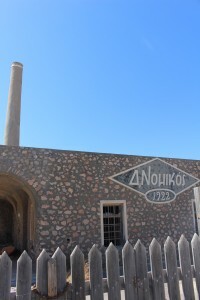 Back then, Monolithos boasted Scorpios and another hotel, plus the Loizos and Skaramagkas tavernas. Not much has changed here since, save the addition of a few guest houses, a pizza restaurant, and a minimarket. And although Sousanna may prefer to see a little growth, the lack of development means this little seaside community remains calm and charming in the height of the summer frenzy. An anomaly. 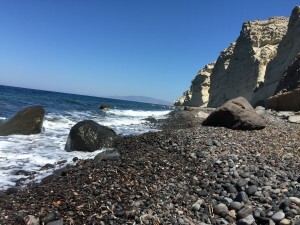 There’s no observable cap on Santorini’s tourist numbers, and like many over-loved tourist destinations, you wonder just how many more busloads of tourists Santorini can sustain – if she’s even sustaining the numbers now. We drove past a Lidl, a Carrefours, a number of Greek supermarkets. We drove past a mega-gym along the top of the island, as large as a football field. Stick Santorini into Airbnb and you’re offered 300+ available properties straight off the bat. How many of these are opportunity-grabbing structures on former farmland? There do seem to be quite a few little house-like structures sitting in fields surrounded by a lot of nothing much except other guesthouses. Water is hard to come by on the island. In the past, residents would collect rainfall in whatever vessels they had. Now, it’s desalinated or delivered. Off Monolithos lies a large hulk of a boat, delivering water. This water’s come a long way in old tanks, which is not an appealing drop. Bottled drinking water is the rule here. The old tanker adds to Monolithos’ industrial vibe. 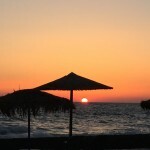 Our waiter tells us the view from Akrotiri still faces westwards, and sunset-watching is just as lovely there as it is from Oia – but without the crush. The next evening, we drive in that direction, and catch the same sun setting over the caldera. Leaving the island the following morning, we greet sunrise on Monolithos beach. That’s nice, too.